Kittur Rani Channamma Nisargadhama mini zoo at Bhutramanahatti about 20 kms from Belagavi city will be converted into a full fledged zoo and a Rs.16.47 crore plan has been sent to Central Zoo Authority. The plan is essentially a first phase development during the next 10 years and aims at creating proper facilities with naturalistic enclosures for animals, development of aviary, facilities for animal care such as veterinary hospital, adequate water supply round the year and other animal-care facilities as well as for the visitors, disaster management system and recruitment of necessary staff for efficient management and maintenance of the zoo. Currently there are 62 animals – seven male and 27 female deers, a pair of male and a female crocodiles, 4 male and 5 female blackbucks, 2 male and 2 female four-horned antelopes and 14 tortoises. 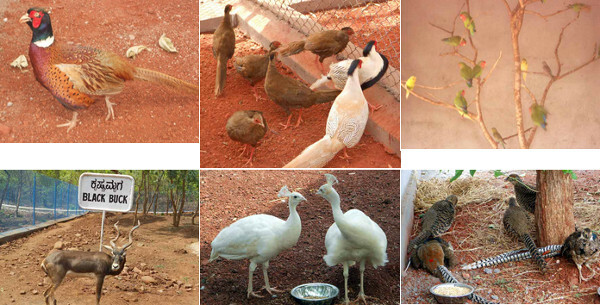 These apart, there are 98 birds, including white peacocks, love birds, peach faced love birds, cockatiel, grey jungle fowl , lady amherst’s pheasant, silver pigeon, plum headed parakeet and common ring necked pigeon. The available facilities at the zoo included three parabola, a nature camp, a children’s park, drinking water and toilets, a ticket counter, a food storage, a canteen, two staff quarters and a small vehicle parking facility at the entrance. The zoo failed to attract the expected number of visitors and could not make revenue to match its expenditure. During 2014-15, its revenue from 66,923 visitors was Rs. 6.11 lakh while the expenditure was Rs. 36.94 lakh. Happy to know & see developments happening in BELGAUM to educate people about ex-setu conservation. Request the people of BELGAUM to make use of such facilities to get self awarness & educate the kids. With all those development work in the zoo, there is no proper toilet facilities for gents as well as ladies, the toilets are uncleaned and no water for using, also the drinking water is not clean.